I do a lot of reading. I don’t watch a lot of television. I prefer to keep it off as much as possible with Davey. So, while he’s playing on his own, I’m reading. I pick up a variety of different books. There isn’t a certain genre I prefer over others; however, I’m not much of a fan of horror books or smutty romance novels. Books need to be one of two things for me…entertaining and mentally stimulating or challenging. I want to learn something as I go along. Fortunately, my love of books rubs off on my son as he’s in love with reading as well. He spends more time sitting in the floor with his books as opposed to his toys or blocks. It makes for a happy mama. 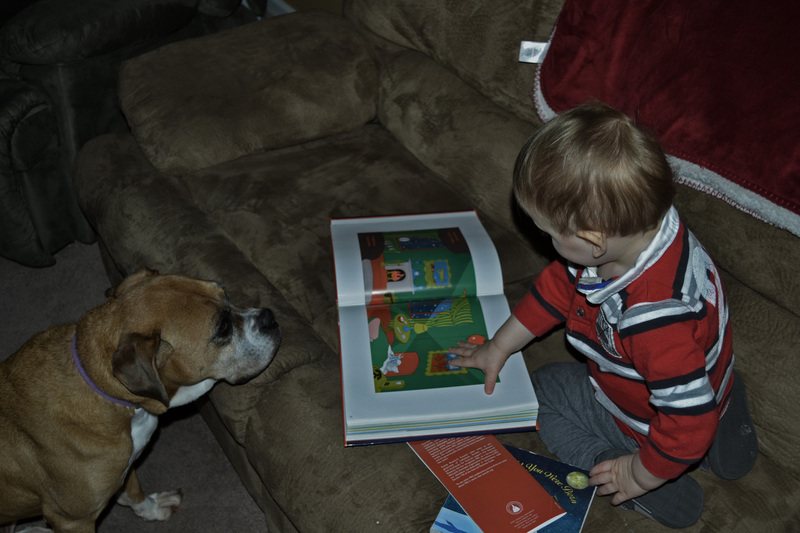 Davey reading to our dog Dixie. So, right now I’m reading a variety of books (I’m always reading more than one, it drives my husband crazy). One in particular, I want to share with all of you. My husband bought it for me at our local Lifeway Christian Store. It’s titled, “52 Things Kids Need From a Mom”. It’s broken down into easy to read segments and basically allows for you to read one chapter a week. Not too terribly difficult; however, I do know a mom with twins who prevent her from doing anything she used to find enjoyable. She doesn’t seem to be able to read books anymore. Mom, you know who you are. I want to post a blog each week on this book as I’m reading the chapters. Perhaps it will open the doors to more discussions between all of my fellow moms out there. 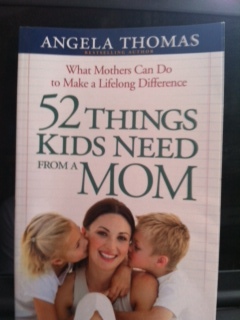 Each chapter starts with the following phrase: Kids Need Their Mom…. Chapter 1 states: To Pray in Secret with The Door Open. What does that mean to you? For me, it means that I don’t have to pray outloud, but I need to do it in front of my son. It’s hard to find the time to pray. I get up early every morning, well before Davey, just so I can read my daily Bible lesson, pray, and then be able to write for a while. Lately, I’ve been encouraging Davey to learn how to pray as well. He can fold his hands, but doesn’t bow his head, and he doesn’t sit quietly with me, but he hears me thanking our Lord for all of our blessings. Making a lifelong difference with our children is long road, with many hills and twists and turns. There are always obstacles, but it’s our duty to navigate our children through these. How many of you take the time to pray with your children? I’m trying hard to be a strong Christian mother, but I don’t always succeed. And when I fail, I pray for forgiveness and strength to try again and I make sure Davey sees that as well.